Jorge Lorenzo (Ducati) qualified on pole position for the third race in a row earlier today at the Aragon circuit. His teammate Andrea Dovizioso qualified in second position with Marc Marquez (Honda) third. All of the Yamahas struggled with Valentino Rossi tying his worst qualifying position ever in 18th place. Take a look here for full qualifying results. Stay tuned for race coverage on MD tomorrow. One needs to look no further than the previous motorcycledaily article to see where YAMAHA’s head is stuffed. They need to get their priorities right! Pissed that beIN was dropped by DirecTV! Same here. But…maybe it’ll open a window to someone who can broadcast it in English and not boisterously talk over top of the whole race at speeds faster than a MotoGP bike. This has to be one of the worst weeks in Yamaha’s history. 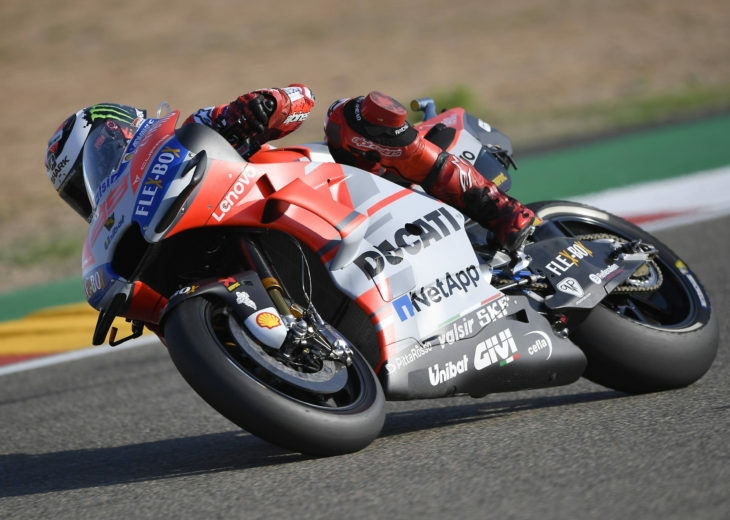 On top of laying an egg in MotoGP, they anounced a massive sales slide, liquidation of their California Headquarters, and a pullback in MotoAmerica. Do you have links to the sale slide and liquidation of their CA Headquarters?? I’ve been a Yamaha fan for 50 years, and would really like to know more. This saddens me. Yikes. I wouldn’t be surprised if the 2019 Yamaha sports a V4 like its rivals if for nothing else but to make a statement to its riders and the paddock that they are getting real about solving its lack if competitiveness problem. And props to Lorenzo on pole. Dovi has the edge so far with race pace, but Jorge might find something in the 11th hour. And you can’t ever really discount Marquez. Just thinking that many competitor brands like to tie in their race designs to what’s on the showroom floor. I feel offering a V4 is saying a bit too loudly that they’re now following. Is that a good position to have to admit? What about the I4 faithful who stuck it out for the tuning fork brand? Now if Yamaha instantly started taking podiums with their own designs I think they’d lose little face. But that’s a gamble, racing’s a gamble, is that something Yamaha would easily wager? Tough times it sounds. I think it would in some respects be following, but sometimes following is the right move. I’ve read that the I4 should allow for more flexibility with weight distribution which is important for tuning the chassis and dialing in handling characteristics. Since the Yamaha has struggled terribly with that these past two seasons, I wonder how relevant that theory really is in practice. Honestly, while the engine isn’t their only problem, I do think a new engine is needed, though I don’t think it would matter much at all whether it was an I4 or V4.